Elizabeth Pond, the respected American author who has reported on Eastern Europe for three decades, recently wrote a eulogy for Ukraine. The seizure of Crimea, Russia's military rout of the Ukrainians in the east, and the humiliating ceasefire imposed on President Petro Poroshenko, she wrote, meant that Ukraine was again "a borderland playground" for its mighty neighbor. Poroshenko, says Pond, gambled that the Ukrainian army could defeat the Russian-backed insurgents without provoking an outright Russian invasion. He was mistaken. Ukrainian military defeat in late August was followed by a September 5th ceasefire, in which Poroshenko conceded three years of special status to secessionist Donetsk and Luhansk. Those districts adjacent to Russia form the core of the Donbas region that accounts for 20 percent of Ukraine' industry and 18 percent of its population. A further setback followed. In mid-September, Poroshenko visited Washington, receiving a tumultuous reception from congress. But the Obama administration rejected his appeal for precision weaponry that could defeat the rebels. Ukraine was exposed as dismembered and alone. 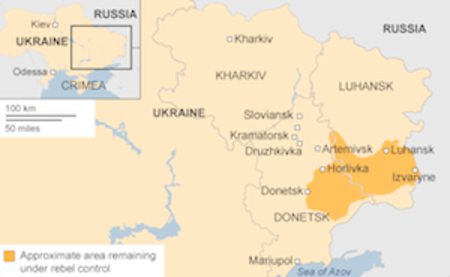 Russia's objective of subjugating and destabilizing Ukraine had succeeded. So what is the importance of Ukraine's parliamentary election on Sunday? The best that can be hoped for, say analysts, is public endorsement of Poroshenko and Prime Minister Arseniy Yatseniuk's program of economic and political reform. The president's 'Petro Poroshenko Bloc' is expected to be the biggest winner with over 30% of the vote. Yatseniuk's People's Front is projected to get 6 to 9 percent. Five to ten parties are expected to enter parliament. 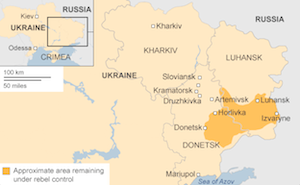 Analysts say only 23 percent of Ukrainians in the Russian-speaking east are likely to vote. With the election being boycotted by separatists and the party of disgraced former president Viktor Yanukovych not participating, this will be Ukraine's first election in which pro-western and pro-Russian parties are not pitted against each another. The election, says Oxford University's Timothy Garton Ash, can provide legitimacy to Ukraine's reformist leaders. Their task, he says, is to build a properly functioning state, something that has not occurred during 23 years of independence. Poroshenko and Yatseniuk. This month they pushed through the outgoing parliament anti-corruption legislation of the kind required by the European Union as a condition for an economic association agreement. Yatseniuk hails the provision that government officials make public their assets and financial transactions. Poroshenko calls the legislation a "decisive step against the cancerous tumor of corruption." But these promises have been made before and nothing happened. Transparency International, the anti-corruption agency, ranks Ukraine even lower than Russia, a dismal 144 on its corruption perception index of 177 countries. Russia is 127. In July, an economic advisory panel advising the Kyiv government declared, "swift and radical economic reforms must be undertaken if Ukraine is to seize this historic opportunity to clean up corruption." It identified as essential: macro-economic stabilization, rule of law, regulatory reform, free market pricing for energy, tax simplification, trade enhancement, land reform, and bank restructuring. Canadian economist Oleh Havrylyshyn, a member of the advisory body, says as of now not one of the recommendations has been implemented. However, he's optimistic that reforms will begin after the election. When Poroshenko and Vladimir Putin met in Milan on October 17 progress was reportedly made on the acrimonious dispute over gas supplies and pricing. Opinions are mixed whether Russian gas shipments -- suspended since June -- will resume before winter. Ukraine confronts severe energy shortages, something economist Havrylyshyn says will only be resolved through the painful medicine of market based pricing. Ukraine's economy is declining with gdp growth for 2014 forecast at minus 8%. Ukraine does have a $17 billion bailout program with the International Monetary Fund, conditioned on rigorous reforms. As with Russia, Ukraine's currency has lost value, down 18% against the dollar in the past three months. Through the persistent gloom one analyst sees hope. Hudson Institute scholar David Satter, a former Moscow correspondent, says the Maidan protests against dictatorship and corruption have inspired Russia's long-suffering citizens. Speaking October 1 at Washington's Institute of World Politics, Satter said Russia's "unambiguous aggression in Ukraine" revealed Putin for what he is...."the head of a criminalized gang..who ignited civil war." Post-communist Russia and Ukraine, Satter continued, evolved in similarly corrupt ways with oligarchs controlling the economy. Both Putin and Yanukovych, he said, became parasitic. Theft and corruption began at the top. Lawlessness and moral decay became pervasive. Putin was threatened, said Satter, by Ukrainians desire to connect with the European Union, a western alternative to a hopeless status quo. Despite the current nationalist fervor, Putin's Ukraine adventure, argues Satter, hastens his eventual demise. He makes no prediction as to when. Can Ukraine reform? Can oligarch Poroshenko and his alllies take on Ukraine's oligarchs and build the free, rule-based society they profess to want? The answer should be apparent within 6 to 12 months. Barry D. Wood has written extensively about post-communist economic transformation. Twitter @econbarry. A version of this post appeared on marketwatch.com.